Make sure the apple cider vinegar you use passed our tests and is right for you! It can be hard to pick the best apple cider vinegar (ACV) because what makes it effective -- acetic acid -- can also make it a poison. You can't always tell from the label what you're getting. Our tests show that some products are authentic, pure, and have the right amount of acetic acid, while others don't or, worse, are so acidic as be potentially poisonous. 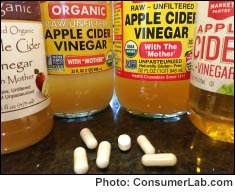 ConsumerLab.com purchased and tested 6 popular apple cider vinegars and 6 apple cider vinegar supplements sold as capsules or tablets. We checked whether their chemical profiles matched that of real apple cider vinegar, determined the concentrations of acetic acid, and checked for contaminants (arsenic, lead, and cadmium). If a product was a tablet, we also checked that it would disintegrate properly to release its ingredients. What did we find? The liquid vinegars (some with the "mother" and others without) were generally of high quality, although some were better priced than others, offering greater value. Among the pills we found the amount of acetic acid to range just 0.4% to over 30%, causing some to be considered poison. Products that were the best quality, best value, and safe were chosen as our Top Picks. You must be a ConsumerLab.com member to get the full test results along with ConsumerLab.com's Top Picks and Consumer Tips on how to choose and use apple cider vinegar. You'll get results for 12 supplements: 10 selected by ConsumerLab.com and two that passed the same testing in our voluntary Quality Certification Program. What apple cider vinegar can and cannot do for your health, including blood sugar control, weight loss, digestion, and topical use.